On July 19–20, thirty-six New Staff Members from the National Institutes for Cultural Heritage visited the Institute as part of their training. They toured the Reading Room of the Department of Art Research, Archives and Information Systems, the Performing Arts Recording Studio of the Department of Intangible Cultural Heritage, and the Chemistry Laboratory and the Biology Laboratory of the Center for Conservation Science and Restoration Techniques. On July 24, four visitors from the Special Research Office of the House of Councilors visited the Institute in order to observe Institute’s facilities. They toured the Reading Room in the Department of Art Research, Archives and Information Systems, the Performing Arts Recording Studio in the Department of Intangible Cultural Heritage, and the Chemistry Laboratory in the Center for Conservation Science and Restoration Techniques. 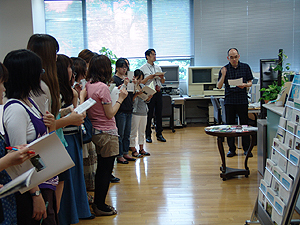 On July 31, thirty-five visitors from the Ministry of Education, Culture, Sports, Science and Technology’s “Support Project for Study Programs on Radioactivity and its related Topics for High School Students” visited the Institute in order to study methods of scientific analysis on cultural properties and how X-rays are used in their research. They toured the Radiography Laboratory, the Chemistry Laboratory and the Scanning Electron Microscope Laboratory in the Center for Conservation Science and Restoration Techniques. 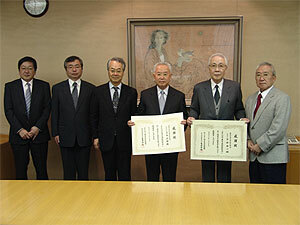 Offers for donations to the Institute were received from the Tokyo Art Dealers’ Association and the Tokyo Bijutsu Club. The Tokyo Art Dealers’ Association aims to fund publication of the Institute’s research results and the Tokyo Bijutsu Club intends to fund the Institute’s research projects. We received the donations with great appreciation. 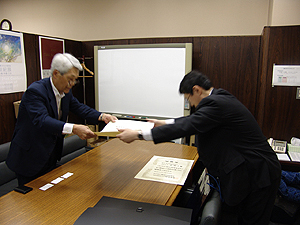 On June 11th, Shingo Rokukawa, Director of the Department of Research Support and Promotion, visited the Tokyo Art Dealers’ Association and met Katsumi Kiyoshi, the general manager of the Tokyo Art Dealers’ Association to present certificates of appreciation to Keiichi Shimojo, the director of the Tokyo Art Dealers’ Association, and Masakatsu Asaki, the president of the Tokyo Bijutsu Club. 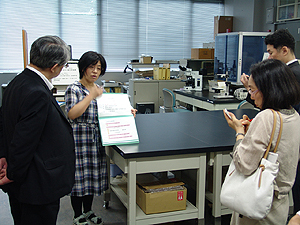 On June 28th, sixteen visitors from Kawamura Gakuen Woman’s University, Faculty of Education, Department of Social Education visited the Institute in order to view work to conserve and restore cultural heritage as part of their coursework in Museology.They toured the Library of the Department of Art Research, Archives, and Information Systems and the Chemistry Laboratory and Conservation Laboratory of the Center for Conservation Science and Restoration Techniques.The staff members in charge of each section explained the work they do. On April 23, four visitors from the Office for Incorporated Administrative Agency Support of the Agency for Cultural Affairs visited the Institute in order to observe the Institute’s facilities.They toured the Library of the Department of Art Research, Archives, and Information Systems, the Performing Arts Studio of the Department of Intangible Cultural Heritage, the Conservation Laboratory and the Chemistry Laboratory of the Center for Conservation Science and Restoration Techniques, and the Archives of the Japan Center for International Cooperation in Conservation.The staff members in charge of each section explained the work they do. 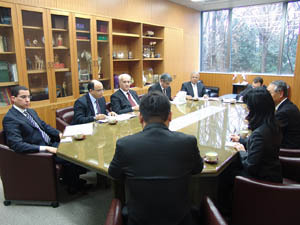 On January 20, nine visitors, including Mr. Mohamed Ibrahim Ali Said, Egypt’s State Minister for Antiquities and Mr. Hisham El-Zimaity, Egypt’s Ambassador to Japan, visited the Institute in order to pay a courtesy call on the director of the Institute and to view the Institute’s laboratories. They toured the Conservation Laboratories and the SEM Laboratory of the Center for Conservation Science and Restoration Techniques, and the Restoration Studio of the Japan Center for International Cooperation in Conservation. The staff members in charge of each section explained the work they do. 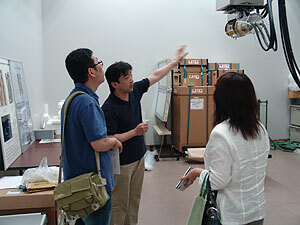 On November 10, fourteen participants in the Kyushu National Museum’s “Project to Encourage Active Use of Museums” visited the Institute to view research activities related to conservation of cultural properties in order to facilitate the implementation of integrated pest management (IPM) at their individual facilities. 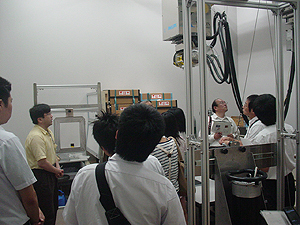 The participants toured the Restoration Laboratory, Fumigation Laboratory, and Biology Laboratory of the Center for Conservation Science and Restoration Techniques and the Restoration Studio of the Japan Center for International Cooperation in Conservation. The staff members in charge of each section explained the work they do. On November 15, four visitors from the National Research Institute of Cultural Heritage, South Korea visited the Institute as part of a conservation project. The visitors toured the Image Laboratory of the Department of Art Research, Archives, and Information Systems and the Restoration Laboratory and Chemistry Laboratory of the Center for Conservation Science and Restoration Techniques. The staff members in charge of each section explained the work they do. 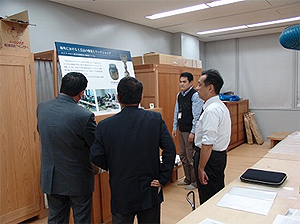 On November 11, Mr. Yokokawa, Director of the Historical Museum of Nagasaki Shipyard and Machinery Works, visited the Institute in order to view the studio and the laboratories where the lacquered shelf of the Argentina Maru, a piece in the museum’s collection, is going to be restored. 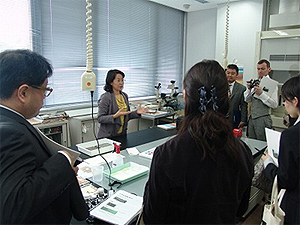 Director Yokokawa toured the Conservation Laboratory and Chemistry Laboratory of the Center for Conservation Science and Restoration Techniques and the Restoration Studio of the Japan Center for International Cooperation in Conservation. The staff members in charge of each section explained the work they do. On November 25, Profs. A. Ochir and Matsukawa visited the Institute in order to exchange opinions with our specialists on the Birch-Bark Manuscripts that were recently excavated in Mongolia. 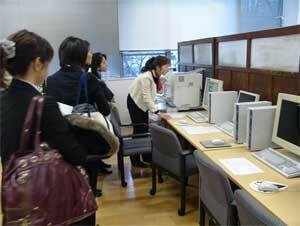 The visitors also inspected the current state of conservation of paper in Japan. 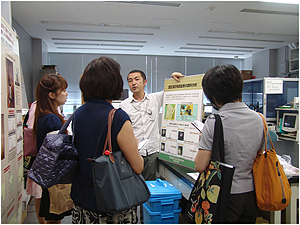 The visitors toured the Conservation Laboratory and the Chemistry Laboratory of the Center for Conservation Science and Restoration Techniques and the Restoration Studio of the Japan Center for International Cooperation in Conservation. The staff members in charge of each section explained the work they do. 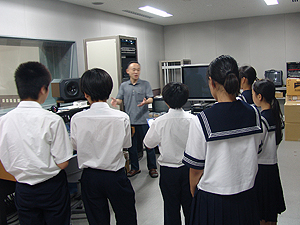 On September 16, six students from Okachimachi Taito Junior high school visited our facility as part of learning activities at their school. The students toured the Performing Arts Studio of the Department of Intangible Cultural Heritage. The staff members in charge of the section explained the work they do and answered their questions. On August 3, two visitors including a conservator of the Gyeongju National Museum, Korea visited the Institute in order to view work involved in the conservation of cultural properties. 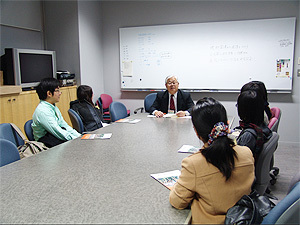 The visitors toured the Library of the Department of Art Research, Archives and Information Systems, the Performing Arts Studio of the Department of Intangible Cultural Heritage, the Restoration Laboratory and the Radiography Laboratory of the Center for Conservation Science and Restoration Techniques, and the Restoration Studio of the Japan Center for International Cooperation in Conservation. The staff members in charge of each section explained the work they do. 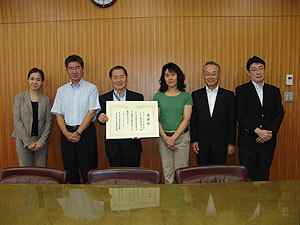 An offer for a donation to the Institute was received from Larson Juhl Nippon. Larson Juhl Nippon donated 4 vacuum sealers (Fuji Impulse, V-402) to the Institute in order to support our research into rescuing cultural properties affected by the Great East Japan Earthquake. These vacuum sealers will be used to restore books, documents, and other paper-based items damaged by seawater from the tsunami caused by the earthquake, and we have already put them to use in our Salvage Project for Cultural Properties damaged by the tsunami. On August 3, the Institute was visited by Taisuke Okawara, General Manager of Larson Juhl Nippon, and Kamei Nobuo, Director General of the Institute, presented a certificate of appreciation to Mr. Okawara. We are glad the firm is aware of our activities and we are most grateful for the donation. We are sure to use the donated equipment to rescue cultural properties. On July 4, four visitors including staff of the Kyujanggak Institute for Korean Studies visited the Institute in order to view work involved in the conservation of cultural properties. 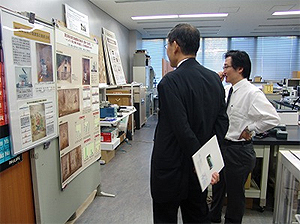 The visitors toured the Library of the Department of Art Research, Archives and Information Systems, the laboratories of the Center for Conservation Science and Restoration Techniques, and restoration studio of the Japan Center for International Cooperation in Conservation. The staff members in charge of each facility explained the work they do. On July 7, four visitors including staff of the National Taiwan Library visited the Institute in order to view work involved in the conservation of cultural properties. The visitors toured the laboratories of the Center for Conservation Science and Restoration Techniques. 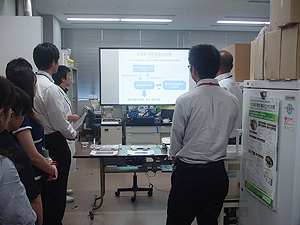 The staff members in charge of each laboratory explained the work they do. As part of a training session, eighteen new staff members of the National Institutes for Cultural Heritage visited the Institute on July 21, and thirteen new members visited on July 22. Each group toured the restoration studio of the Japan Center for International Cooperation in Conservation, the Library of the Department of Art Research, Archives and Information Systems, and the Performing Arts Studio of the Department of Intangible Cultural Heritage. The staff members in charge of each facility explained the work they do. On January 17, the visitors came to the Institute in order to view conservation efforts and research on materials related to textiles. 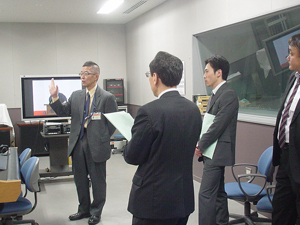 They toured the Library of the Department of Research Programming, the Audio-Visual Documentation Section of the Department of Intangible Cultural Heritage, the chemical laboratory of the Center for Conservation Science and Restoration Techniques, and the Japan Center for International Cooperation in Conservation. The staff members in charge of each facility explained the work they do. They came to view the site of conservation and restoration of cultural properties on December 6. They toured the Japan Center for International Cooperation in Conservation and the Center for Conservation Science and Restoration Techniques on the fourth floor, the restoration studio of the Center for Conservation Science and Restoration Techniques on the third floor, and the Library of the Department of Research Programming on the second floor. Those in charge of each facility provided explanations and answered questions. On November 29th, they visited us as part of external study. 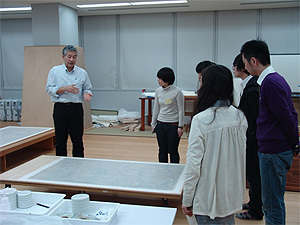 After Deputy of Director General Nakano explained the outline, they toured the restoration studio of the Center for Conservation Science and Restoration Techniques on the third floor, the Library of the Department of Research Programming on the second floor, and the X-ray Room of the Center for Conservation Science and Restoration Techniques on the basement floor. Those in charge of each facility provided explanations and answered questions. 30 participants (and others) of a repair engineer training session of cultural properties (art craftworks) hosted by the Agency for Cultural Affairs. They visited the Institute on October 28th as part of the training session in the title. 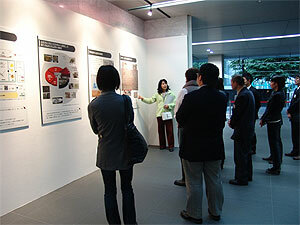 They toured the Center for Conservation Science and Restoration Techniques on the third floor, panel exhibition on the first floor, and the Audio-Visual Documentation Section of the Department of Intangible Cultural Heritage in the basement. Those in charge of each facility provided explanations and answered questions.